*(I. )* The Great Moguls -- Babar -- Babar's Connection with Agra -- *(II. )* Humayun -- Interregnum: Shere Shah -- *(III. )* Akbar -- Akbar's Connection with Agra -- *(IV. )* Jahangir -- Jahangir's Connection with Agra -- *(V.)* Shah Jahan -- The Monuments of Shah Jahan's Reign at Agra -- *(VI. )* Aurangzîb -- *(VII. )* Agra and the Later Mogul Emperors -- Agra in the Mutiny. The Mûti Masjid -- The Dersane Darwaza -- The Dîwan-i-âm -- Jahangir's Cistern -- The Tomb of Mr. Colvin -- The Inner Mîna Bazar -- The Chitore Gates -- The Hindu Temple -- The Machhi Bhawan -- The Najina Masjid -- The Dîwan-i-Khas -- Jahangir's Throne -- The Baths -- The Samman Burj -- The Khas Mahal -- The Underground Chambers -- The Anguri Bagh -- Shish Mahal -- The "Somnath" Gates -- The Jahangiri Mahal -- The Sahmgarh. 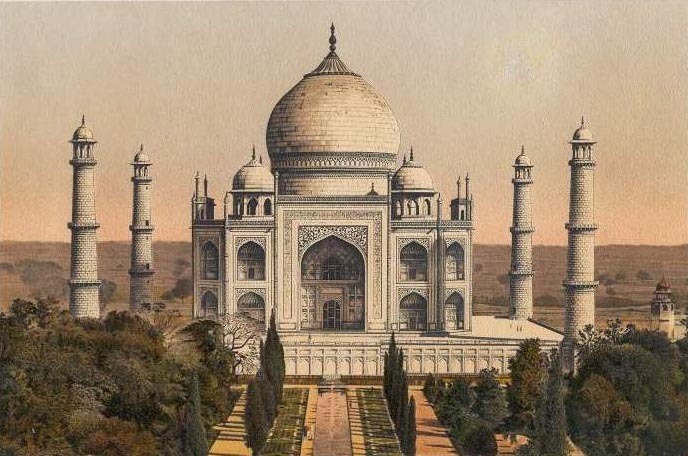 The building of the Taj -- The Intention of the Taj -- Description. Akbar's Tomb -- The Kanch Mahal -- Suraj-Bhan-ka Bagh -- Mariam Zâmâni's Tomb. The Kali Masjid -- Alawal Bilawal -- The Hammam -- The Roman Catholic Cemetery. The Agra Gate -- The Naubat Khana -- The Mint -- The Daftar Khana -- The Palace -- The Kwâbgâh -- The Turkish Sultana's House -- Hakim's Baths -- Pachisi Board -- The Dîwan-i-Khâs -- The Ankh-Michauli -- The Yogi's Seat -- The Hospital -- The Dîwan-i-âm -- The Panch Mahal -- Miriam's Kothi -- Jodh Baí's Palace -- Rajah Birbal's House, or Birbal's Daughter's House -- The Hathi Pol and Adjoining Buildings -- The Jâmi Masjid, or Cathedral Mosque -- The Baland Darwaza -- The Stone-Cutters' Mosque -- The Houses of Abul Fazl and Faizi. Bharatpur -- Govardhan -- Muttra -- Bindrâban.